I got a text from Barry again last week, asking if I'd be interested in getting some pictures from another building in downtown Little Rock. This would be another building that rarely grants access to visitors, let alone photographers. So I was eager to take him up on the offer. The only problem....it would be at sunrise. 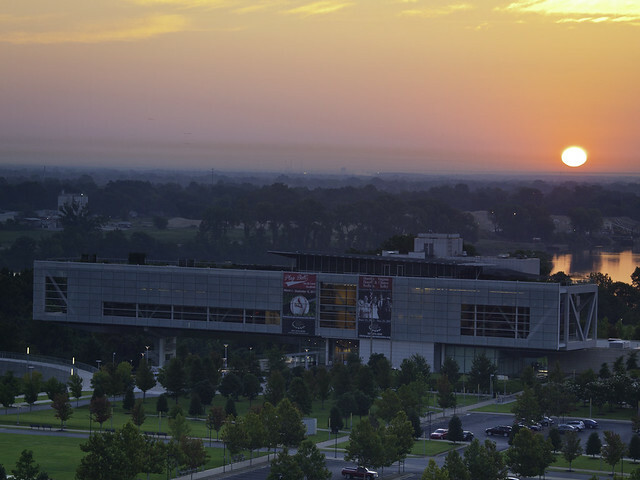 I had to work that morning, so around 7:00 I decided to leave since I had to drive clear across Little Rock to get to the office. But I didn't need to worry, since there isn't much traffic going into the suburbs. I made it to the office in far western Little Rock in no time at all. I even got there about 15 minutes early, much to the amazement of my boss. This has been such a strange year, weather-wise. We are currently in the middle of a record-breaking drought, with baking temperatures well above 100 degrees. But the past few weeks have been relatively moderate, with highs only in the upper 80s. Compared to earlier in the summer, it was downright chilly outside. 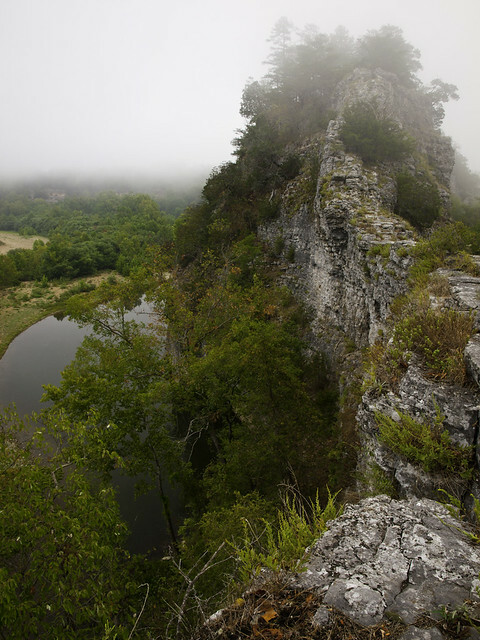 So when Zack proposed a camping trip to the Buffalo River a few weeks back, I was game. The overnight lows were predicted to be in the 60s. It would be perfect camping weather, especially considering it's usually 110 outside. So after sitting through rush hour traffic on I-40, we finally made it onto Hwy. 65 and drove up north into the Ozarks. 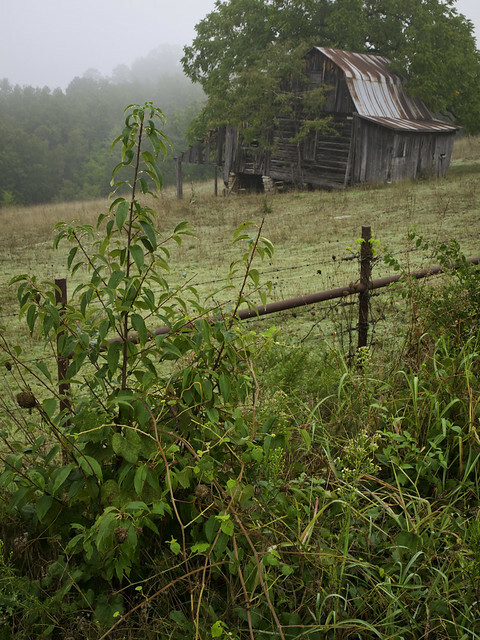 Along the way, we stopped to get a few pictures of this old barn along the side of the road. You can tell the drought is in effect, the trees are already starting to turn a bit. 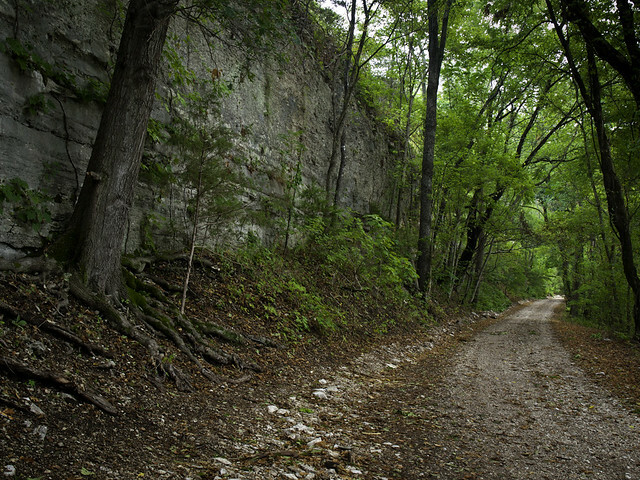 Eventually, we finally turned onto a dirt road that would take us into the Richland Creek valley, near where it flows into the Buffalo River. It was already dark by the time we stopped to set up camp in a field next to the road. It would be an ideal camping spot, the grass in the field made a nice soft pillow to put the tent on. It was an amazingly clear night, so after putting up the tents we grabbed the cameras and attempted to take some star pictures. 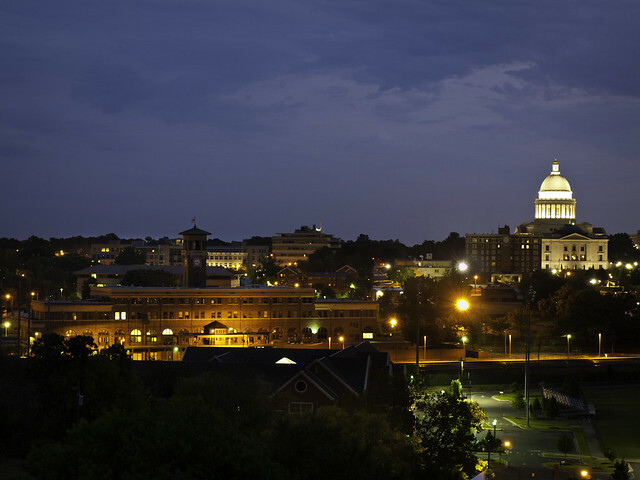 I live in Little Rock, and most of the stars are diminished by city lights. But out here, you could see thousands upon thousands of stars. The Milky Way was out, I don't think I've ever seen it that clearly. Alas, none of my pictures really turned out. Around 11:00, we retired to the tents to try to catch some sleep. There was already a layer of fog developing along the hills surrounding the field, and the next morning promised to have some good conditions for taking a few pictures. I settled into the sleeping bag, but had troubles falling asleep. I restlessly tossed about, but never could really doze off. So I was perfectly aware of any nighttime visitors to our campsite. Earlier that evening, we could hear some coyotes off in the distance. So I was a wee bit worried when I started hearing something moving around outside the tent, at around 2:30 in the morning. Something (Bigfoot, Chupacabra, the Ozark Howler?) was lurking outside. I heard a few loud sniffs that sounded uncomfortably close to the tent. But then whatever it was ran off, and it sounded like it had hooves. So I'm assuming that it was some of the resident elk herd paying us a visit. A little bit later a few more other animals decided to investigate the two odd tents sitting in the field. They must have thought we were fine there, and none of them tried to eat us. A few hours later, I asked Zack if he had heard any noises that night, and he just said that he was sound asleep and missed everything. The alarm clock went off at the painfully early time of 5:30 am, and I slowly climbed out of the tent. 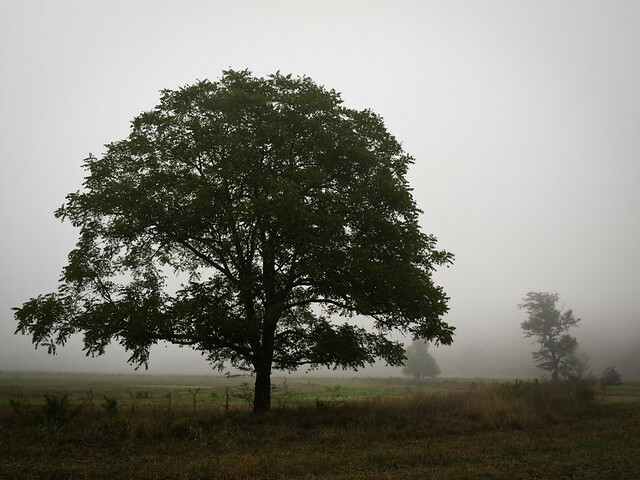 There was a thick layer of fog in the valley, so we rushed through the wet grass (everything was covered with dew) and took some pictures of a large pecan tree that was near our campsite. We struck down the camp, and got into the car to explore more of the valley. 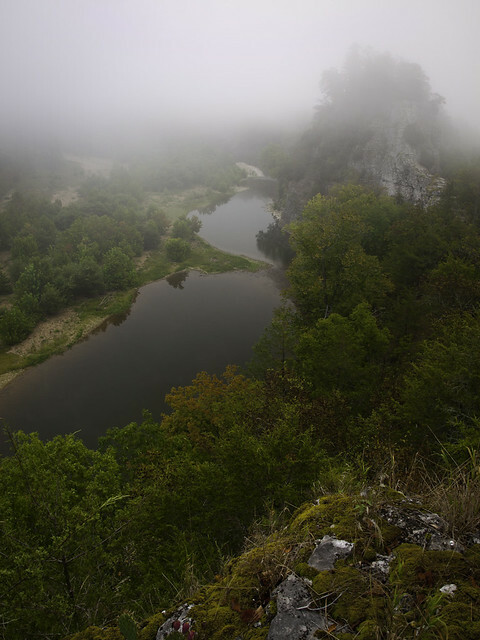 It is a very scenic area, even with the fog covering everything up. 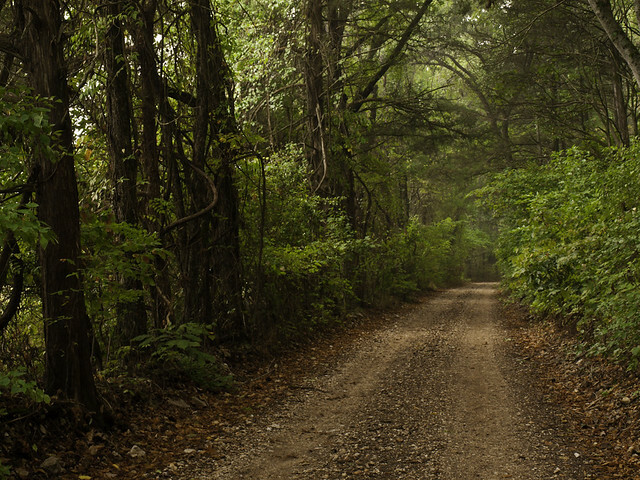 The narrow dirt road has old trees lining each side, which kinda added to the aura of an overlooked and isolated area. You get the impression here that there have hardly been any visitors there. We quickly parked the car and headed up the short (but really steep in one spot) trail that leads to the Nars. 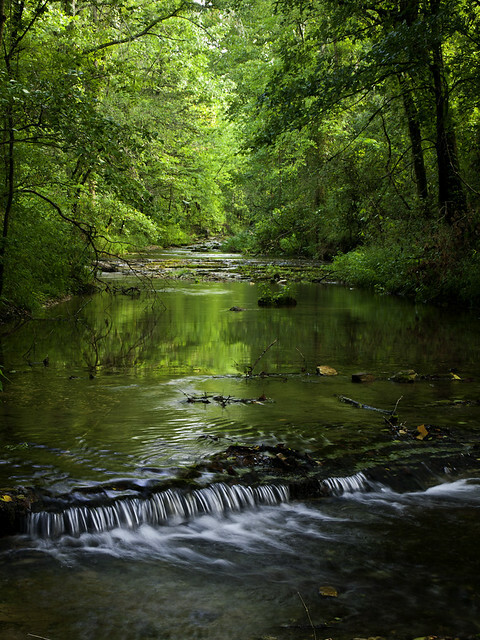 The Nars is a neat spot on the Buffalo River. 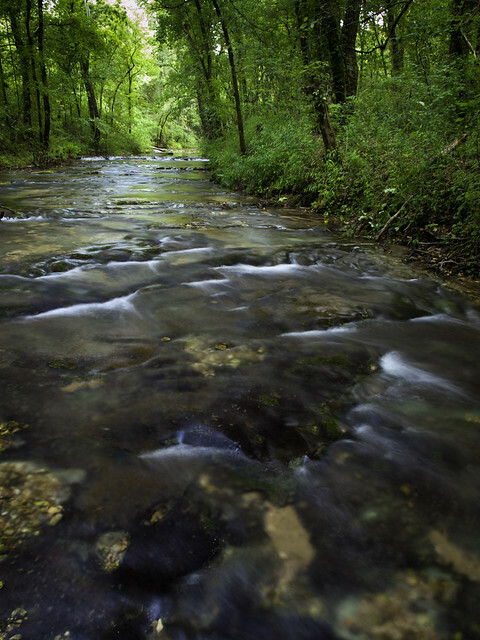 It's the remnants of a mountain, that once sat in between the Buffalo River and Richland Creek. The two rivers carved and eroded away much of the mountain, so all that remains is a narrow sliver of rock that is only a few feet wide in places, but about 100 feet tall. 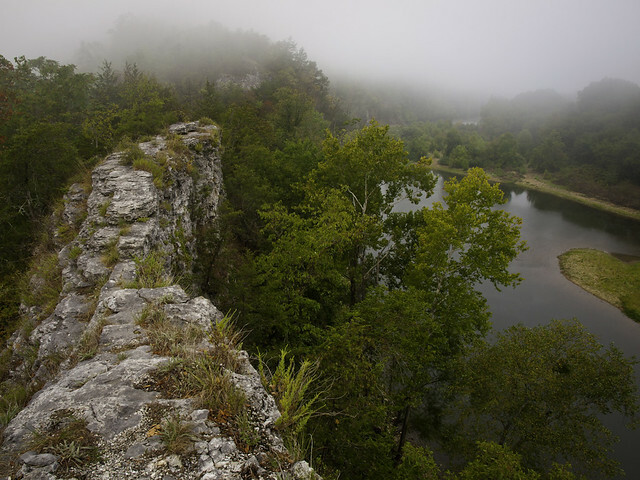 The Buffalo River still flows beneath the unique bluff, but Richland Creek has since migrated to the other side of the valley. 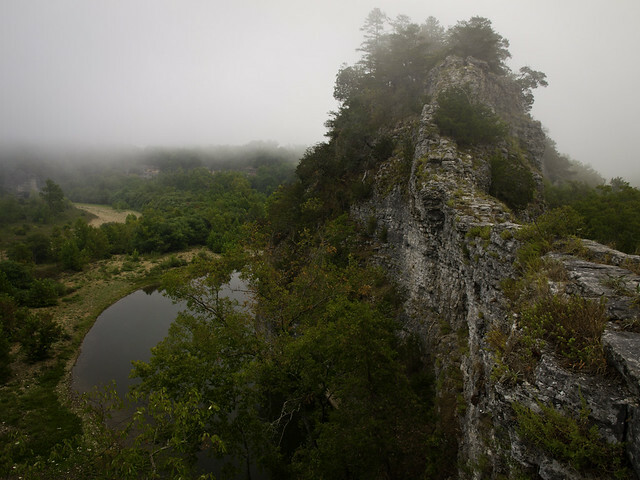 The view from the top of the Nars is great, with the fog drifting through the trees at the top of the bluff. I was a wuss and didn't dare travel too far out on the bluff line, since it was a spooky combination of narrow rocks and tall bluff. We hiked over to an overlook on a nearby hillside for this view (with fog nearly covering up the Nars). I was surprised to see some cactus plants growing on the top of the bluff there. While on the top of the Nars, we could hear an elk calling out from the field below us. We passed by one field and saw a few elk, in fact it was four bull elks. 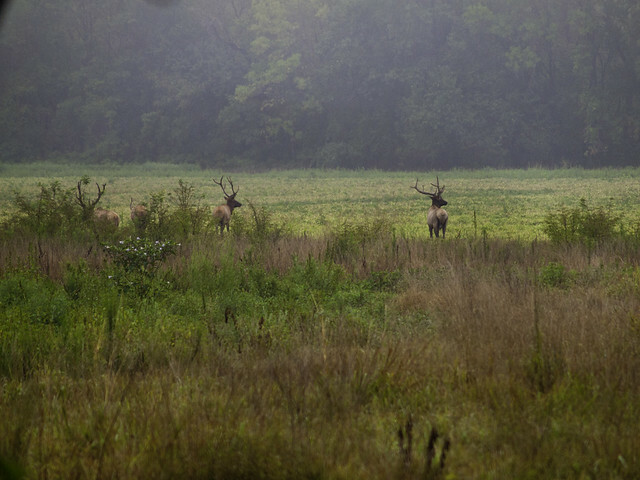 The elk here aren't as used to humans being around, like the ones in Boxley. They eyed us warily and started to walk away when they saw me with the camera. This isn't a great picture, at all, but I'm showing it to prove that the elk were there (and that I wasn't hallucinating hearing them at 2:30 in the morning). We forded the Buffalo at Woolum and headed north, making a brief stop at this old barn that sits nearly hidden in the woods. The sun had yet to burn off the thick fog, so we quickly drove over to another access point on the river at Mt. Hersey. I had always thought this part of the river was called Mt. Hershey, and I'm really disappointed that it's Mt. Hersey. The correct name has taken away several chocolate-related puns I planned on using here. 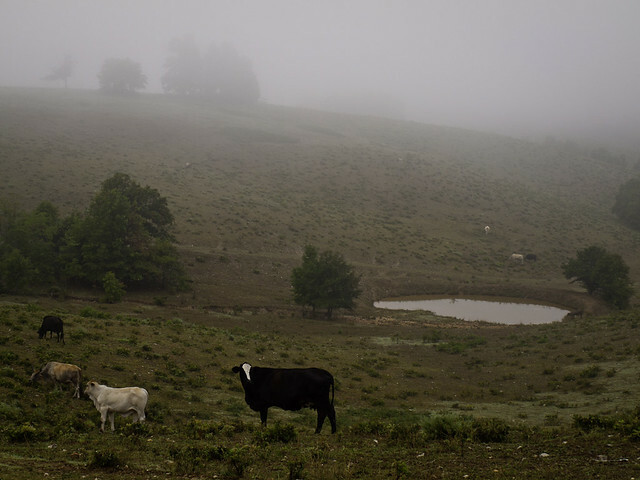 The fields and hillsides were coated in a fog like a heavy blanket, but the cows didn't seem to mind. 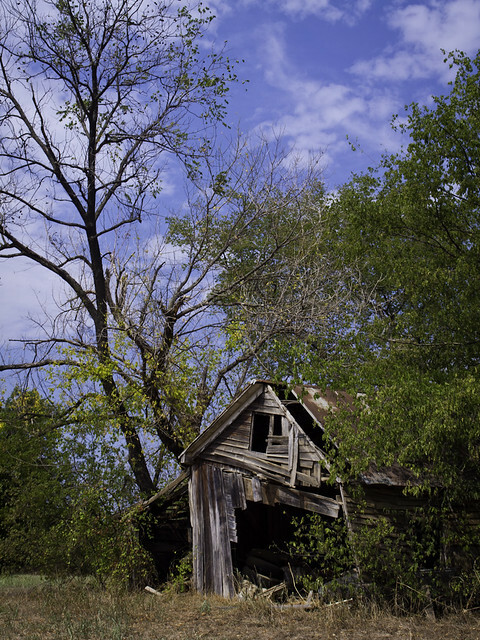 We stopped at this old barn, which was built on stilts and is now leaning a bit precariously into the hillside. We made it to the river access at Mt. Hersey just as the sun broke through the fog. The light was bad for pictures of the river, but we soon found this stream that was flowing into the Buffalo. It must be spring-fed, since it had a decent amount of water flowing through it. And with the sun out, we took a few more pictures and then made the long drive back to Little Rock. The major difference in this drive is that instead of rush hour traffic on the freeway, we were stuck behind a few loose cows in the middle of the road. I traveled out to western Arkansas last weekend to attend my Aunt's 60th birthday party, and decided to make a quick stop while driving back towards home on Sunday. 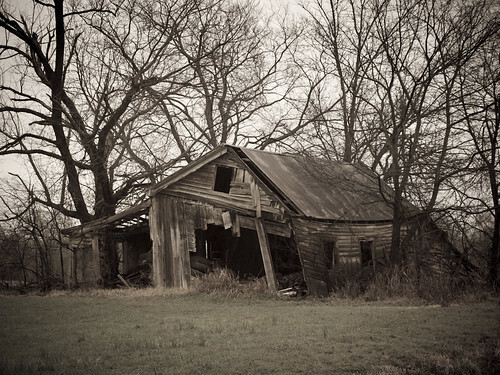 There is a neat old barn that I drove by last year that I wanted to check in on. It was in a pretty bad state then, leaning a bit too precariously. I was interested to see if it was still standing. And also to take a few pictures of it, too. 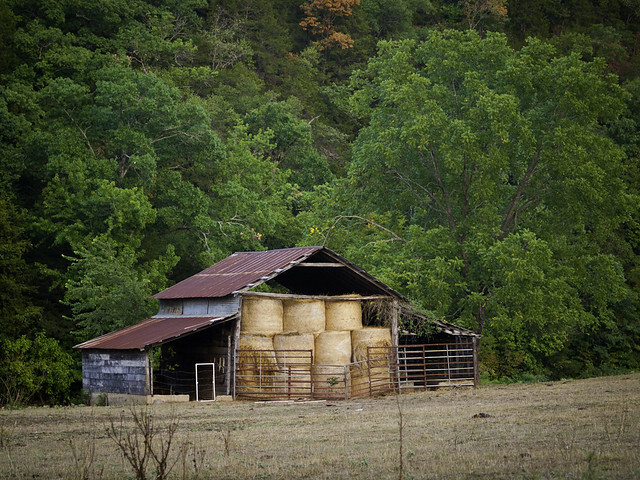 After driving down a dusty dirt road for a few minutes, I was happy to see the barn was there and was still standing. 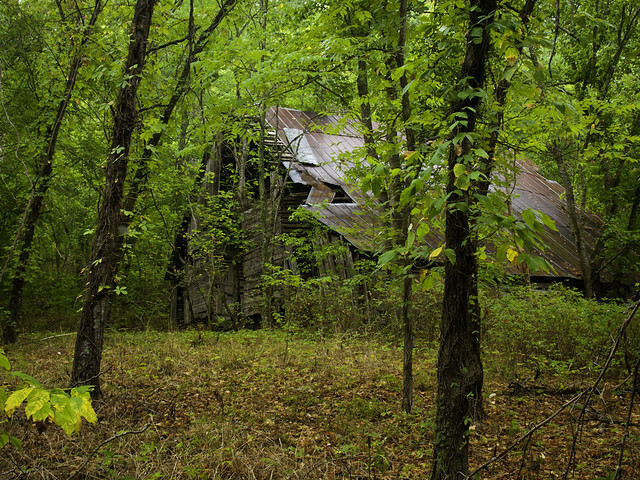 Since my last visit there was on a cold and rainy winter day, my plan was to get a newer shot of the barn now with some green leaves on the trees. There was a flaw in my plan. We are in the middle of one of the worst droughts in decades, so the trees aren't all that green right now. The grass in front of the field was dry and brown. You know there hasn't been much rain when the grass makes crunching noises when you walk on it. But here is the shot of the barn now, I'd like to try to get a shot of it in the autumn (if we have any fall colors this year). I got a call from Barry Hamilton last week, inviting me to tag along with him and take a few pictures. 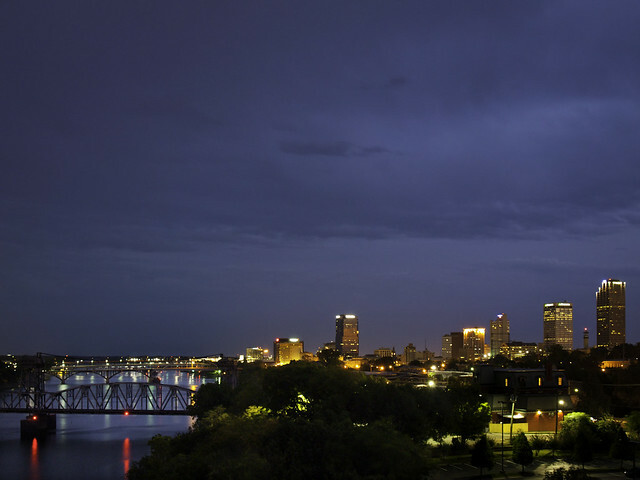 Barry had secured access to the roof of a building in downtown Little Rock, which promised to provide some pretty views of the skyline and river. The company that owns the building doesn't typically let people up on the roof, so it was a rare change to get a new view of the city. There was one condition, we just couldn't say where the shots were taken if we did decide to show them off. There was a nice sunset, which I didn't really get any good pictures of. But I did manage to get a bit of the dying light of the sunset reflected in the glass of the Stephens Building.